Here are some general guidelines for buying fish which will help you select only the best. Seafood is generally not landed on a Sunday - any fish you buy on a Monday will be Friday's fish. Wait until Tuesday to visit your fishmonger for fresh seafood. 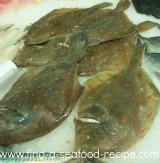 Whole fresh fish should have bright eyes - avoid those with sunken eyes. The skin should be shiny, moist and firm and the scales firmly attached. There should be a faint sea fresh aroma. The gills should be a healthy reddish pink. When you touch the fish, your finger should not leave an imprint - the flesh should be firm. When buying fish fillets or steaks the flesh should be firm and it should have a fresh smell - if it's dull, dry or smells 'fishy' then don't buy it. When buying smoked fish, the fillets should be dry, firm and glossy - bear in mind that 'dry' is different to 'dried out'! I lived in Hull and I used to buy my fish direct from the dockside suppliers on the same day it was landed. I'd take it home, portion and freeze it, knowing it was as fresh as possible. When I moved inland, I couldn't get the same freshness and I found buying fish very disappointing in comparison. 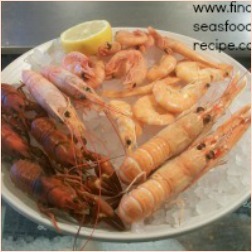 This delicious seafood platter in the photo at the top is an example of the freshness you can get. A specialist fishmonger is OK - likewise the supermarkets - but they are getting their fish the day after it's landed - at the earliest. Then they put it on display where it sits until you buy it - how old is it then? If you stop and think about it, a mail order fish supplier buys what he needs on the day - they don't keep stock, there's no point. Dead fish don't make good pets nor do they earn anything whilst they sit in the chiller - they go off! Your fishmonger or supermarket buys what they think they will sell - it sits on the slab (and goes back to the chiller at the end of the day) until either you buy it or it goes out of date. That's why I've gone mail order for my fish now - I have never been let down and if there is any problem with the quality of fish you get delivered, then you ask for a refund - simple as that. The fish gets to you at least as quick, if not quicker than it gets to the supermarket shelves - prices are immaterial when it comes to quality fish. The supplier I deal with in the UK has only one price for each type of fish - there's special offers of course, but there is only one price because there's only one quality - the best. Look round your supermarket shelves - why is that piece of salmon cheaper than that piece? Why should there be different qualities? 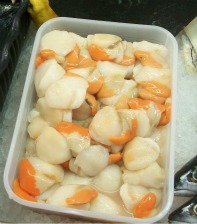 If you live near the coast, then a specialist fishmonger will have fresh fish - once again though, he buys what he thinks he'll need and what's left goes into the chiller overnight, to be sold the next day. I really can't stress enough that freshness is the most important thing when buying fish - if you want the best, then you really should give mail order a try at least once so that you can compare. 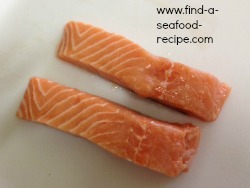 Simple step by step instructions with photos showing how to freeze fresh fish.